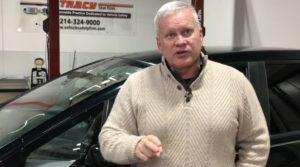 The Tracy Law Firm will in two weeks begin crash-testing three 2010 Honda Fits to demonstrate what it thinks will be evidence of improper repairs and aftermarket parts compromising crash performance. Owner Todd Tracy successfully sued John Eagle Collision Center, with a Texas jury finding that the shop’s failure to follow OEM repair procedures during a more than $8,000 hail repair for the vehicle’s prior owner increased the severity of a subsequent collision. The jury found the auto body shop’s work was responsible for 75 percent of Matthew and Marcia Seebachan’s ordeal related to the 2013 crash — and therefore $31.5 million out of the $42 million in damages awarded. The Dallas County jury attributed the other 25 percent of the blame to the other driver. The Seebachans have since settled with the dealership for an undisclosed amount. Tracy’s clients bought the car in 2012 without knowledge of the prior body work. 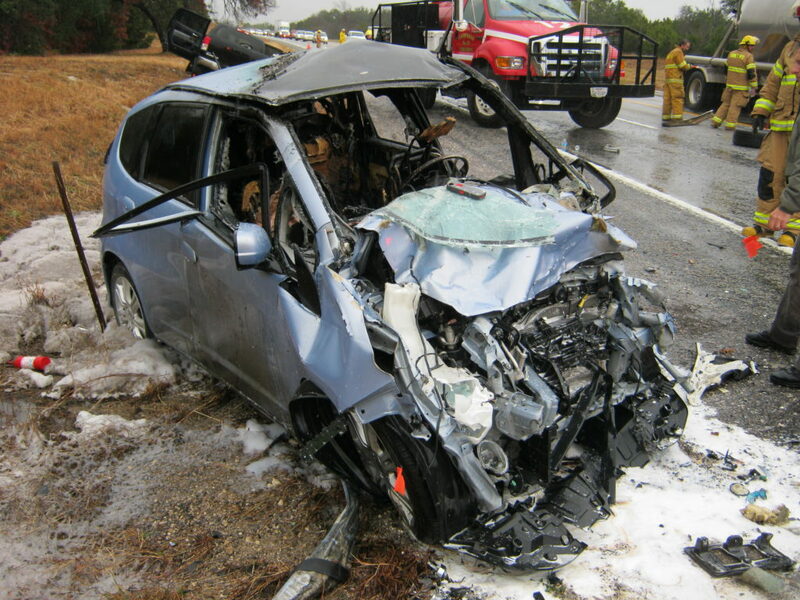 They were traveling in the Fit on a 75 mph stretch of road in 2013 when a 2010 Toyota Tundra in the other lane hydroplaned into their path, leading to the Fit striking the right front quarter of the Tundra in a T-bone collision. Tracy’s experts reported that the Fit would have survived the crash far better had John Eagle Collision followed Honda OEM repair procedures, which demand a shop tack-weld the front and rear corner edges of the new roof and then perform a combination of two- and three-plate spot welds and MIG plug welds. The Fit scored a “poor” Insurance Institute for Highway Safety 40 mph small-overlap crash test rating but a “good” on the 40 mph moderate-overlap crash-test. A Tracy expert said the Tundra collision more closely resembled the moderate-overlap crash. 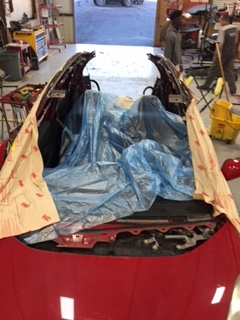 John Eagle Collision body shop director Boyce Willis in a deposition agreed the facility bonded the roof with 3M 8115 adhesive despite little concrete evidence or engineering knowledge to support the decision — particularly as 3M and Honda instructions state otherwise. Tracy starting later this month will subject three 2010 Honda Fits to the IIHS small-overlap crash test. The test bangs a quarter of the vehicle’s front into a barrier at 40 mph, simulating a front edge of the car striking a pole or tree. One Fit will be the control subject. 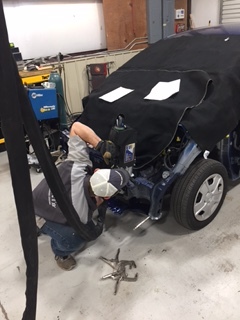 The other two received variables introduced by Burl’s Collision Center, the body shop owned by Auto Body Association of Texas President Burl Richards. Richards’ shop replicated the repair done by John Eagle Collision on the second Fit. 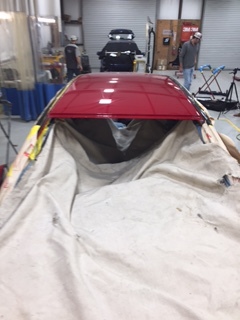 The shop bonded the roof with 8115 adhesive instead of welding it, and it installed an aftermarket windshield, just as an imitation had been used for the Seebachan Fit’s prior owner. There has been speculation that the front windshield had also been improperly installed — experts have wondered if the roof flange had been painted instead of following the usual best practice of bare metal, epoxy, urethane, glass. Richards wrote in an email that his shop had painted the flange when replicating the Seebachans’ Fit. The third Fit will replace common OEM collision parts with aftermarket imitations. This will include Certified Automotive Parts Association-certified fenders and a CAPA-certified hood. Burl’s Collision also installed a non-CAPA aftermarket radiator support, bumper reinforcement bar, left and right hood hinges and windshield. Aftermarket parts are not generally approved or recommended by auto manufacturers for use by body shops. Based on an email and photos from Richards shared by the Tracy Law Firm, some of the aftermarket parts already don’t match the original Honda editions — which doesn’t bode well for their performance during the testing. 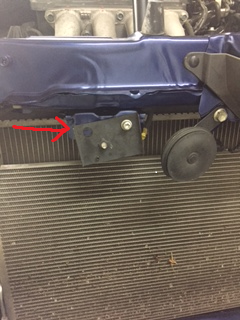 According to Richards, an aftermarket Fit radiator support failed to align correctly, preventing supplemental restraint system impact sensors from aligning. “Both left and right side sensors are mounted this way,” Richards wrote. 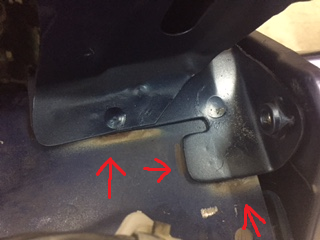 It also was only able to receive a single bolt in one area. 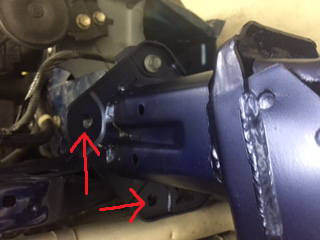 The aftermarket bumper reinforcement also failed to “bolt up properly, due to misaligned holes,” and the shop only could secure it with two bolts rather than the four installed in the original. Richards’ shop didn’t try to force the components to fit, something some shops have attempted in the past with other aftermarket parts. “I did not want to manipulate the AM parts in any way,” he wrote. Requests to CAPA and the Automotive Body Parts Association seeking comment early Friday afternoon had not yet been returned.